The hotly-anticipated annual list compiled by craft beer's governing body was released today with some big changes since last year's list. All of the macro acquisitions of 2015 have yet to be finalized in the BA's eyes, and brands such as Lagunitas (#6), Ballast Point (#11), Breckenridge (#47) and Four Peaks (#49) remain on the list despite being snapped up by conglomerates hungry for craft beer's sales numbers. 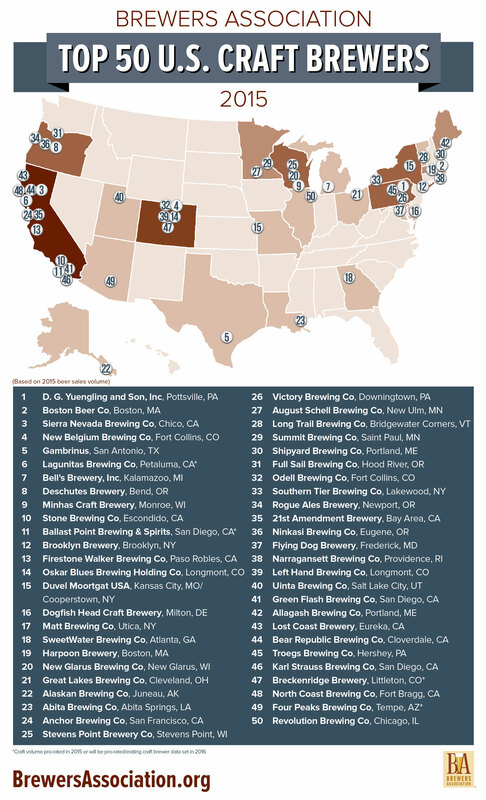 Ballast Point, once again, was the largest mover on the list, skyrocketing up 20 places on the list to land at number 11. Founders, which was a big mover on last year's list, was left off because it sold a 30 percent stake to Spain's largest brewer, Mahou San Miguel. Lower down, Chicago's Revolution Brewing made its first appearance, rounding out the list at number 50. "The top U.S. brewers continue to drive demand, growth, innovation and exponential interest in beers from small and independent brewers," said Bart Watson, chief economist, Brewers Association. "With a historic record number of breweries in U.S., the top brewers continue to open new markets and expose beer drinkers to a variety of fuller-flavored styles and offerings." North Coast Brewing Co Inc.